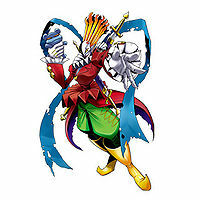 A strange-looking and elusive Demon Man Digimon that is completely shrouded in mystery. 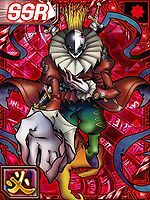 Demon Man Digimon have many mysterious qualities, and since Demon- and Undead-species are basically beings from another dimension, their true forms are not totally understood. Why it appeared, and the purpose of its existence are also unclear, and there are currently no means of clarifying those questions. 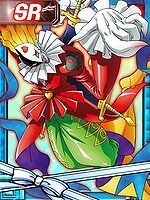 However, its strength is without equal, and if you happen to stumble across Piemon, you probably won't be able to do anything but curse your fate. 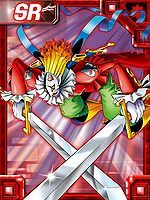 Its Special Move is an inescapable technique in which it teleports the four swords that pierce the "Magic Box" on its back, causing them to skewer the opponent in the following instant (Trump Sword). 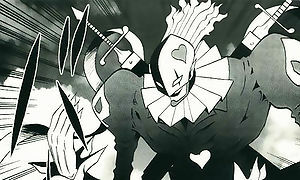 Title: 「地獄の道化師」 — "Hellish Clown"
n., From pierrot 「ピエロ Piero」, which means clown. adj., Means to be multi-colored or mottled. Also, a pun on the Pied Piper of Hamelin, a legendary character from German folklore. Anime/Manga Digimon Adventure: "The Four Heavenly Kings of the Demonic Mountain! The Dark Masters!" 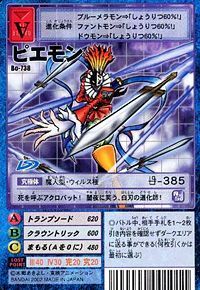 トランプソード Toranpu Sōdo Card of Swords[N 1]/Trump Sword Draws several swords from the sheathes on its back and flings them at its opponent. 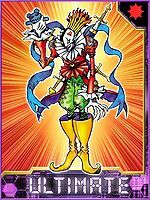 クラウントリック Kuraun Torikku Clown's Trick This attack has been used to cover several attacks, but is most known for turning the opponent into a key chain and causing explosions. 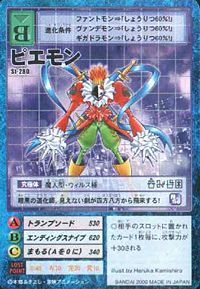 Does various magical effects including transformation and disguises and reflecting an opponent's attack back. 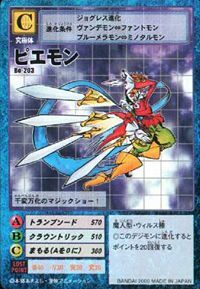 Creates a field in which all communications can be read by Piemon's mind and allows it to teleport itself and its attacks anywhere at will. 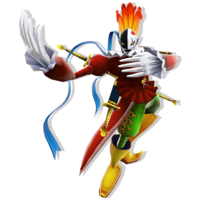 Creates powerful gusts of wind with a swipe of its hand. エンディングスナイプ Endingu Sunaipu Finishing Sniper Fires a magical blast from its hands. 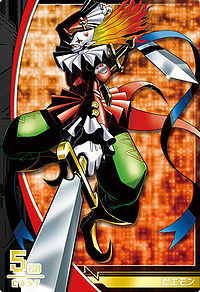 Piemon was the leader of the Dark Masters, a group of four Ultimate level Digimon born of Apocalymon's chaos. 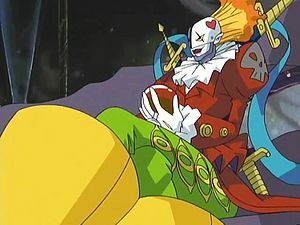 He was responsible for leading a raid on the facility from which Gennai's group operated before the Chosen Children's partner Digimon were born, stealing their Tags and Crests and hiding them throughout the Server Continent. 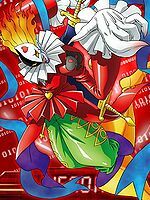 Years later, while the Chosen Children were in the real world combating Vamdemon, he and the other Dark Masters successfully conquered and reformatted the Digital World, twisting it into Spiral Mountain. He was the leader of the Nightmare Soldiers, and his domain was a corrupt dark wasteland, though he never left the Dark Masters' headquarters plateau atop Spiral Mountain. Proving too powerful to outright kill and having repeatedly overwhelmed War Greymon and Metal Garurumon, he was instead sealed away in another dimension by Holy Angemon's Heaven's Gate. A Piemon is the partner of Sigma. He has the ability to read all communications within his Masks Square. He was deleted and had his data absorbed by Arkadimon. 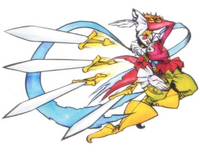 Piemon was one of the enemy digimon revived by Millenniumon to battle Akiyama Ryo. He was extremely fascinated by Lord Millenniumon's power. Piemon evolves from Fantomon (0+ DP) or Tekkamon (0+ DP). 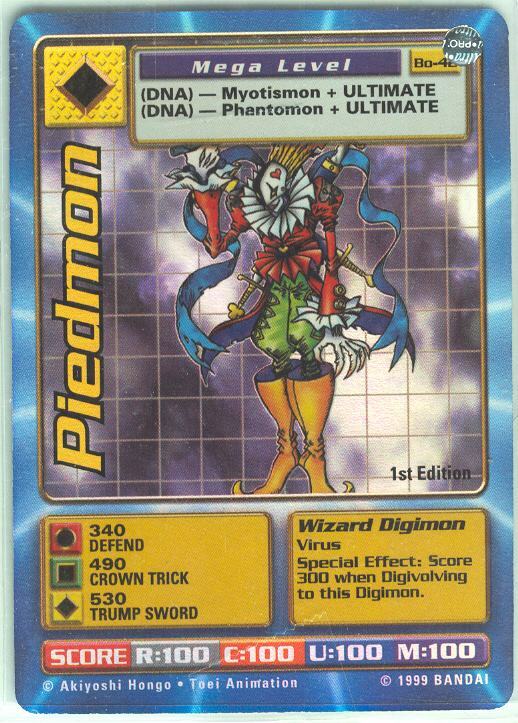 Piemon is an enemy digimon. 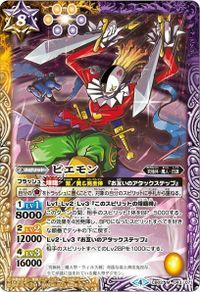 Can be evolved from Etemon if above level 45 and Spirit above 190. 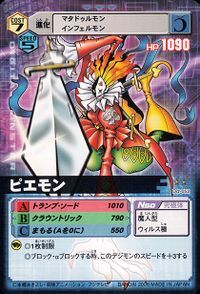 Piemon is an obtainable mercenary Digimon which evolves from Fantomon at Lv 41 and can further evolve into Chaos Piemon at Lv 65 with the item Trump Sword. 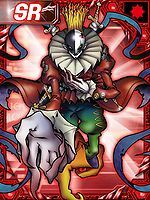 Obtainable by Jogressing Vamdemon or Fantomon with a compatible Digimon. 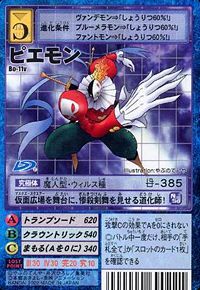 Piemon is the boss Digimon of Area 07 and is available to be-friend upon victory. Can be evolved from Vamdemon with 0 Calls, Perfect Level Requirements. A clown of darkness. Its unseen swords come flying from all directions! Everything is a mystery! 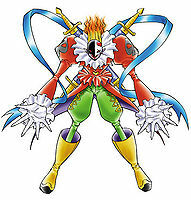 This Demon Man Digimon appears when you least expect it! An acrobat that calls upon death! 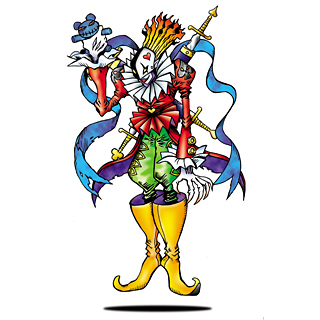 This pierrot wields its white blades and laughs into the night! Dancing swords! The clown raises the curtain for its massacre show time!! 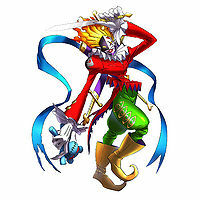 A clown who displays its sword dance of slaughter on stage at Masks Square! A mysterious Demon Man whose origins and motives are all unclear. Because it can appear out of nowhere and possesses powerful abilities, all who meet it will have to brace for the worst. 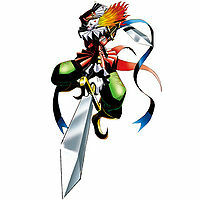 A strange-looking and elusive Demon Man Digimon that is completely shrouded in mystery. 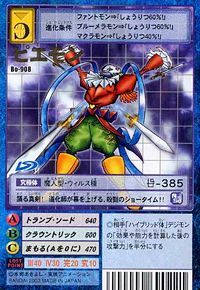 ↑ Digimon Adventure: "The Four Kings of the Mountain of the Devil! The Dark Masters!" 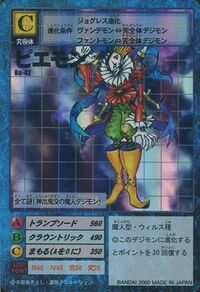 ↑ Digimon Adventure V-Tamer 01: "Alias 1 - Sigma"
↑ Digimon Adventure: "The Clown from Hell, Piemon"
↑ "Swords," spades in English, is one of the 4 factions of playing cards.